MAC Award nominee and all-round jazz marvel Mychelle Colleary is bringing her unique and beautiful show exploring the November Nebula from New York to London and I shall be appearing as a special guest. Champagne Charlie is having a few nights off, so I'll be taking the reigns for 3 weeks. Trash Tuesday is an open mic night for singers at London's intimate New York style cabaret bar CellarDoor. Singers bring your sheet music. It's free entry, but there will be a hat passed for tips, so bring handfuls of cash. Seven years and still going strong. The most successful relationship in my life: Cabaret Confidential showcases 4 singers in the sumptuous Art Deco surroundings of The Pheasantry. There's a full Pizza Express menu available: cabaret and pizza, what more could you wish for? Tickets here. 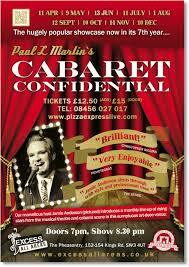 Express menu available: cabaret and pizza, what more could you wish for? Tickets here. Even bigger and better in its second year, the Cabaret Convention brings together cabaret performers from all over to network and discuss issues that face the cabaret performers working today. In the evening, I'll be painting on a face and hosting the cabaret featuring delegates from the convention. The grand finale showcase of the UK's only two week cabaret course for singers designed and delivered by Paul L Martin and me. I'll be hosting this summer's five participants who'll be showing some of the skills they've been working on for an audience of friends, family and industry professionals. Tickets here. How else to spend your Tuesday night then singing show songs in a converted toilet? I'm taking the reigns once again for one of the longest standing open mic nights for singers in London. Singers bring sheet music. I'm back! A chance to see some awesome live music and dance performances and workshops from a diverse and international array of talent. And me. Dressed as a Ring Master, sweating like an X-Factor contestant approaching a key change. Run by Barbican Centre in conjunction with Gillett Square. A murder is once again announced! Having survived Murder on the Barge, the team are back for another irreverent Agatha Christie spoof that will be teeming with innuendo, red herrings and surprise deaths, featuring the ample talents of Tricity Vogue, Champagne Charlie, Benjamin Louche, Becky John and writer/director/Joan Hickson-fan Paul L Martin. 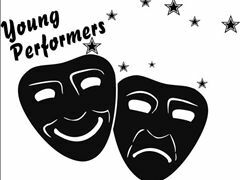 To prove I am capable of entertaining a family audience, I'll be channeling my inner Philip Schofield/Andi Peters/someone that doesn't make me sound old at this monthly showcase of young dance talent from across the UK. I'll be interviewing the acts and most likely being upstaged by 5 year olds. Look at me, singing in a proper fancy piece of music, backed by the 60-piece London Schools Symphony Orchestra and the 60-person snapshot choir! The very talented Stuart Hancock has been commissioned by the Barbican to write a song cycle representing the London Zeitgeist using musicians from a range of styles and I'll be there representing cabaret in a specially written song lambasting reality TV talent shows. I've already been told I'm not allowed to climb off the stage. After being the very first host of this crazy talent show 10 years ago, I am returning, along with (almost all) the previous hosts in a battle of ego and reputation to see which of us will be crowned the ultimate host. It'll be like Battle of the Somme with body glitter. The 13th annual Battersea Barge Panto (my 9th, I think, although it's hard to remember through the booze) is a mash-up of Pirates of The Caribbean and Disney's Little Mermaid. 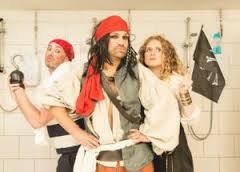 I shall be toning DOWN the eye make-up and donning a matted brown wig to give my Captain Jack Sparrow. It will be silly, it will be rude, I will climb on a table, it will be bucket loads of fun; it's basically everything to make your festive plans complete. It always sells out, so book your tickets quickly. It's Champagne Charlie's night off, so I'll be hosting the open mic night at London's intimate New York style cabaret bar. Singers bring your sheet music. It's free entry, but there will be a hat passed for tips, so bring handfuls of cash. I'll be reuniting with uke-meister and all-round glamstress Tricity Vogue when I guest on her monthly show Ukulele Cabaret. This month's theme is Secret Agent Cabaret and we'll be reviving some of the songs from Heels Of Glory. Various members of the cabarati converge to talk shop and network the day away and I shall be there in the evening to host the showcase which will feature lots of lovely cabaret totty, I mean, talent. Day of dance performances and workshops for all ages and abilities, run by Barbican Centre in conjunction with Gillett Square. 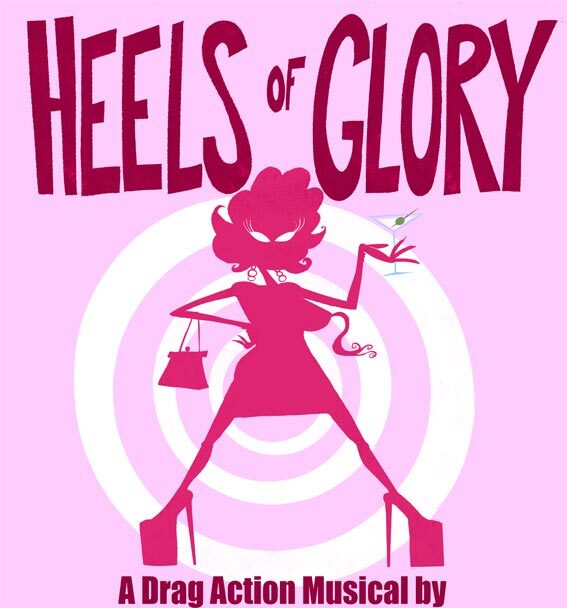 Heels of Glory is an original musical with an action movie plot, a ’60s camp aesthetic, and the kind of tunes that would have graced a vintage James Bond movie — if they’d ever made one with song-and-dance numbers and Sean Connery in drag! Murder on the Battersea Barge sees the cream of London cabaret cavort on the Battersea Barge solving the dastardly murder of Lady Pinchsnuff with the help of monocles and tap shoes. There is murder, there is dancing, there may even be “acting” and there definitely isn’t a fourth wall!